Hear exhibiting artists Linda Judge and Melanie Jayne Taylor, with special guests Sandra Bridie and Greg Gerrand, discuss the archive and use of history in the creation of new works. In 1997 Linda Judge exhibited a series of works at ‘Talk’, an artists initiative set up by Sandra Bridie on the floor below BLINDSIDE in the Nicholas Building. The works have long since disappeared – some were given to friends and some just got lost along the way. In this project, Judge remakes the work reflecting on a practice that has spanned some 30 years. IMAGES | Linda Judge, Further Evidence, 2016, Photo Rebecca Ramage | Images courtesy of the artist. There are moments that act on us like magnets, drawing us into them over and over. Memories echo into our present, you can sense them, pulsing just under the surface. Like a dull nausea, waves of ache, regret and wistfulness combine together into a pool of luscious longing. Most imposing are those memories that hold within them dualistic sensations, preventing a settled, singular narrative. Like a kink in a mirrored surface, these moments act on our present like a subtle distortion, an undetectable warp. For artist Linda Judge, it was a body of work that sought to follow her long after its end. A final showing of her spray-painted fabric print works came in 1997, as part of Talk, an exhibition held below Melbourne’s BLINDSIDE. Feeling ambivalent and no longer challenged by the method involved, Judge sought to move on. The body of work, however, held fast in the minds of the public, tracing subsequent shifts in her practice. Work that begins to supersede the artist’s original intent, taking on its own agency, makes for a complex relationship between audience and artist. A body of work that holds such sway and public recognition, demands the artist question its abandonment. A remaking of the 1997 work, held the promise of answers for Judge, and perhaps a severance of the work’s hold. 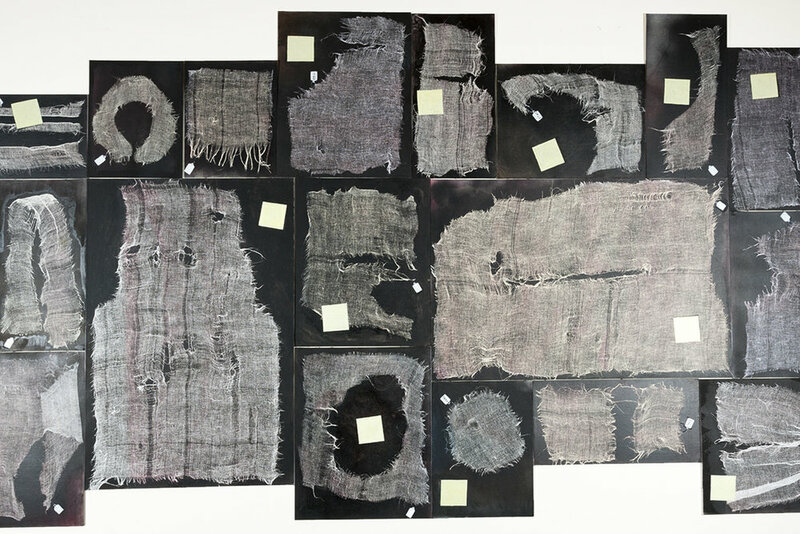 At BLINDSIDE in 2016, Judge remakes the original works using remnants of fabric left over from the original exhibition. Smaller in scale, they lack the gravity of the original works, but act instead as their memory. Arranged in fragmented groupings, the new work presents as embodied memory. A non-linear, randomness; moments shift in and out of focus. They are fragmented pieces of a whole. The works present as an experience of memory, while also being an attempt to reconstruct it. Small labels reminiscent of scientific cataloguing allude to evidence of some greater event, a larger whole. We see Judge struggling here to make sense of the past, to reform and recreate it. Memories change with their remembering, as do the recollections that shape the act of remaking. The remake becomes an impossible task because by its very nature it is self-referential. Oriented within its own history, the work becomes recontextualised. Judge is acutely aware of this. While the scale of the original work is altered, and painted elements introduced, she makes direct reference to the original work through text. Post-it notes stick haphazardly to individual works, acting like disjointed references to the history present. There is an acute sense of time weighing heavily here. Judge is retracing her steps, referencing not only the work but time spent as an artist. There are thirty years here. The myriad of moments lived combine to form a complex network. Seeking to untangle her memories, Judge chooses to remake a moment in her practice, and a dominant one at that. Embodied in her act of remaking is the unmistakable acknowledgement that an art practice must move on, that we must move on, whatever the consequences.